There’s no better moment than now for Mexico to embrace multipolarity by teaming up with China and possibly constructing a Pacific-Caribbean rail corridor across the Isthmus of Tehuantepec, but such a project has its limitations and isn’t anything to get too excited about at this time, let alone blindly jump into just for the sake of satisfying a campaign promise. The crushing victory that Andres Manuel Lopez Obrador, popularly known by his initials as AMLO, dealt to the Institutional Revolutionary Party that has ruled Mexico almost continuously for close to a century proves that the people are tired of The Establishment and eagerly craving the leftist nationalist-populism that this political outsider campaigned on. One of his many platforms included a pledge to double down on infrastructure spending in an attempt to pull his country of nearly 130 million out of the cycle of crime, poverty, and migration that many of its citizens have fallen into, and it’s with this in mind that the Financial Times (FT) wrote about his ambitious plan for what they termed to be a “Mexican Silk Road” (article behind a paywall but available for free at this partnered site). This initiative calls for reviving the early 20th-century plans for an overland rail corridor connecting the Pacific Ocean with the Caribbean Sea across the Isthmus of Tehuantepec in Mexico’s very impoverished southern region, and the FT quotes one of AMLO’s economic advisors as saying that “I can see us perfectly well approaching the Chinese, above all. It’s the type of project they will certainly want to invest in, because they are long-term infrastructure projects with clearly positive returns.” On the surface, the Mexican Silk Road would appear to be a win-win for both parties because it would provide China with an intermodal alternative to the Panama Canal while bringing jobs and development to southern Mexico, but things aren’t always as they initially seem and this project isn’t anything for people to get too excited about at this time. Before addressing the possible shortcomings of this initiative, it’s better to speak to the perceived advantages that it could bring in order to make the contrast even clearer for all readers. 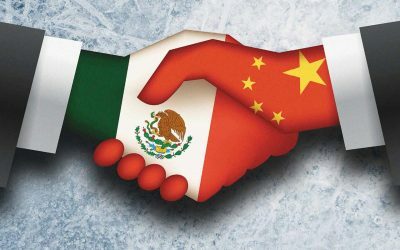 China’s grand strategy in the region is to make Mexico multipolar so that it can have the same function towards the US as America’s newest military-strategic partner India has vis-à-vis China, ultimately enabling Beijing to establish influence on its Great Power rival’s Caribbean doorstep in a similar manner as Washington has done in the South China Sea. If successful in this endeavor, then China might be able to finally “balance” the US and keep it in check, though it’s certain that Washington wouldn’t ever let Beijing’s plans get anywhere near that point without offering up heavy resistance in one way or another. In any case, the first step that China would need to make in this direction is to involve Mexico in its One Belt One Road (OBOR) global vision of New Silk Road connectivity, which is where the Tehuantepec Corridor comes into relevance. This project could become the flagship of China’s North American infrastructural investments and powerfully symbolize Mexico’s new multipolar future after AMLO’s commitment to this model of global reform. Moreover, it would also provide a much-needed solution for replacing the stalled plans to construct a Nicaraguan Canal, a long-delayed project funded by a private Chinese entrepreneur but which appears to have been dealt a deathblow once and for all after the Nicaraguan government’s latest decree last week. Managua surprised the world by giving 10 different militaries the right to train on its territory for “humanitarian purposes”, and while multipolar ones like Russia, Venezuela, and Cuba are included in this new law, so too are the US and even Taiwan, China’s enemy. Considering the latter’s forthcoming military presence in Nicaragua, there’s no way that Beijing could rely on the country as the route of its regional Silk Road. Hybrid War-embattled President Ortega’s de-facto strategic capitulation to the US by indirectly killing the Nicaraguan Canal after allowing US and Taiwanese troops to “train” in his country for “humanitarian” reasons provides a powerful impetus for China to replace this costly maritime corridor with a more economically efficient intermodal one across the Isthmus of Tehuantepec, but this doesn’t necessarily mean that it’ll be built, or that it’ll have its intended win-win effect. For starters, the rapid development of Chinese-Panamanian ties over the past decade saw the Central American country abandoning its recognition of Taipei in favor of Beijing last year, which was considered to be a diplomatic coup carried out right under the US’ nose. While there’s no doubt that Panama largely remains a powerless American client state subject to the mercy of American military pressure in the event that Washington’s New Cold War with China ever turns hot, that’s unlikely to deter the People’s Republic from continuing to use this trade route due to its more economical nature in costing less than creating a brand new intermodal one in spite of the strategic risk involved. After all, with the successful completion of the Transoceanic Railroad (TORR) in South America sometime in the future, China won’t have to transit the Central American isthmus to trade with Brazil when the Mercosur giant can just ship its goods across mountainous Bolivia to Peru’s Pacific port of Ilo. Not only that, but China’s trade with the US is much more important than its trade with any Latin American country, to say nothing of the Caribbean, and is expected to remain so despite the so-called “trade war”. This means that the scenario of the US shutting down the Panama Canal to Chinese ships or indirectly using Hybrid War techniques to disrupt whatever alternative Beijing may have built through Nicaragua or Mexico wouldn’t even matter much to China because its driving Silk Road interest in North America is to streamline connectivity between its own Pacific ports and the US’ in the Gulf of Mexico and the Atlantic Ocean. These would be off limits to China anyhow in the event that it and its rival go to war with one another, so OBOR projects in this part of the world shouldn’t be taken as seriously as in the Eastern Hemisphere. Even if China and Mexico decide to pursue the Tehuantepec Corridor, their plans might not materialize as expected. Supposing that both parties are serious about the Mexican Silk Road, each of them will still have considerable obstacles to surmount in order to make it as viable as envisioned. Before this project can even get off the ground, Mexico needs to ensure the security of all those who will use this Silk Road corridor, thus requiring it to “get its house in order” first by cleansing the military of its many corrupt and cartel-infiltrated recruits while simultaneously resolving the drug violence that makes this part of the country extremely unsafe. This is a lot easier said than done, to put it nicely, and it might ultimately be a “lost cause” that necessitates the presence of “private military contractors” (PMCs, “mercenaries”) instead, though with all of the attendant risks that the introduction of this variable would bring to such an already chaotic situation. Without credibly guaranteeing security for Chinese transshipments and isthmus value-added investments, Beijing will probably never agree to build, let alone use, the Tehuantepec Corridor. Relatedly, even if proper security is provided, AMLO must have a comprehensive plan for turning this project into more than just an overland Chinese-US toll road in order to deliver on his promise of bringing wealth to this impoverished region of Mexico. An initial suggestion would be to establish special economic zones (SEZ) astride this corridor and in each of its terminal ports, but in doing so, the government would need to ensure that jobs aren’t taken by any immigrants from nearby Central American countries. AMLO considers migration to be a “human right”, but it might be politically unwise for him to spend billions in taxpayer funds for constructing a megaproject that his own citizens don’t even end up using because much cheaper migrant workers are employed there instead due to their president-elect’s sympathy with their cause. As for China, it might simply lose interest in the Tehuantepec Corridor if its “trade war” with the US continues and exports to that marketplace drop, no matter how significant they’ll likely remain in the overall sense. A contributing factor to this probable scenario is Trump successfully renegotiating NAFTA or outright withdrawing from it in order to secure the American marketplace from China’s “backdoor” entry to it via economic transshipment outposts in Mexico that abuse this trade deal’s terms through various “legal workarounds”. China’s focus could therefore shift from America to the domestic Mexican marketplace (although it won’t soon come anywhere near replacing it), but this would mean that Beijing would have more of a motive for building infrastructure elsewhere in the country for connecting to its more profitable and already economically developed regions than pioneering what might at that point be the strategically defunct Tehuantepec Corridor. Even if these “trade war” concerns lead to China believing that the costs of this project outweigh its benefits (especially when considering that it could just use the Panama Canal as a much cheaper transit route to the Gulf of Mexico and the Atlantic Ocean per the analysis’ previously mentioned reasons), there’s a chance that the Tehuantepec Corridor could still be built, but only because of both parties’ cynical and separate self-interests involved. China might come to reconceptualize this initiative as more of a financial investment than a commercial one, thereby relying on high-interest loans or other financial means instead of trade in order to reap a profit, while AMLO might for whatever (possibly ideologically misguided) reason want to build a Hambantota-like “white elephant” to show off to the masses. In that case, the confluence of Chinese-Mexican “interests” could make the project possible, though it would lose its original Silk Road purpose. AMLO’s stunning victory has excitedly enabled Mexico to enter a completely new era, and the leftist populist-nationalist has an indisputable mandate to reshape the country according to his promised vision, which crucially includes a heavy infrastructural investment component. The logic of “spending one’s way out of poverty” through public works projects has been tried and tested by the USSR after World War I and the subsequent Civil War, while the US did the same during the Great Depression. While the merits of this policy are controversial because its visible successes in both aforementioned cases may be attributable more to situational factors that extend beyond the reach of economics and into the political (centralized “authoritarian” state model) and military (wartime domestic industrial revival) realms respectively, the concept was apparently convincing enough to tens of millions of Mexicans that they voted for AMLO partially because of it. That being the case, the president-elect is expected to seriously entertain the Tehuantepec Corridor megaproject that formed a key part of his campaign platform, though this initiative needs to be soberly assessed by both his country and its Chinese partners to see whether it’s worth the risk of investing billions of dollars into at this time. It’s not to say that the Mexican Silk Road can’t become a game-changing development in the New Cold War by bringing multipolarity to the US’ southern shores, but just that it isn’t as clear-cut of a win-win idea as it’s been made out to be. Upon closer consideration, it might not even have any real strategic purpose, and even if it’s determined to, then the costs might outweigh the benefits. The last thing that Mexico needs right now is a “white elephant”, but if it isn’t careful, then that might be exactly what it gets.